@extremelypoorfilmaker where is the video? Can you share it again or the workflow you get with Aputure VS-2. Uh! I think I deleted that video. anyway, was a pretty useless video I must say. Nothing that can be done in writing. The monitor works fine with the 5D3 with Magic Lantern running alongside Canon FRIMWARE 1.2.3 Note you can't have external monitoring with firmware 1.1.3 firmware 1.3.3 has not been ported (yet). Just connect camera and monitor via HDMI (best resolution) turn monitor on and then camera. If you have the mirroring option selected in your Menu, you will have a clean feed from the camera with no overlays. All the overlays will remain in your camera monitor. With No-Mirroring, the monitor will became de facto your primary monitor with no image being displayed onto the cam display. In order to review your RAW footage with the monitor you will need to run it in no-mirroring mode. If you do so, it will work fine, but the background of your monitor will display all sort of craziness instead of being BLACK like it normally is through the camera display. Worry not. I do not know why it will do that, but it brings no harm to either the cam or the monitor. The monitor has focus peaking (ML focus peaking is better) False color, Zebras, cropmarks. All works fine. But still, Magic Lantern own cropmarks, zebra etc. are far better than the monitor ones. In essence: Don't buy it. The battery slot at the back will be a bit funny with certain batteries: If bent with the battery facing the ground there is the risk that the battery will disconnect and you will need to tape it to the monitor so that it will not go off as you are shooting. The deal breaker: UNUSABLE outside even with the shader. The screen is so glossy, that you will end up looking at yourself instead of what's going on inside your frame. Perfectly fine in darkness or interiors. My advice: Spend an extra £/$/€100-200 and get a better brand. Did you upgrade? Which one did you upgrade to? I'll take your advice on not buying this monitor. @deafeyejedi recommends the Atomos Shogun. Its a bit pricey but a great backup for recording ProResHQ. I'm looking for a monitor that will let me see the ML overlays but does not have to record to an external hard drive like the Shogun. I want to record MLV Raw with Sound. I am using Firm 1.1.3 Build Mar.02.15. If you want to be able to monitor externally, you should be upgrading to firmware 1.2.3 (Assuming you have a 5D3) There is no external monitoring supported for the firmware you are currently using. If you just need a simple external monitor, Lilliput does interesting stuff not too pricey. How do you record your sound with 5dmk3 ML Raw Firm 1.1.3? Is this list correct? There is no way to record sound into the camera? Magic Lantern -> Modules -> turn on mlv_snd -> Restar your camera. You can record sound with the module mlv_rec activated. (RAW Recording 2.0) Note, the sound will be regulated by audio options in canon menu. Hey @exteremlypoorfilmaker I made a mistake. I already had the Sound option on. I was trying to ask if there is anything that can be done to the Auto Gain Control. I used to have this control on my 5d mk2. Do you know of anything? How do you record your sound? Just str8 from the internal mic? Do you have issues with noise? etc. AGC: Turn it off in Canon menu (Manual). I am on 5d mk3 ML now and got used to using the sweet audio features found on 5d mk2 ML and 60d ML. I only see a few options in MLV_Sound for MK3. Do you know what Trace output will do? I'm am trying to record directly into the camera via a 3.5mm input jack from a wireless lav. I want to have more control over Gain/Volume. Is there a way to control that in 5d Mk3 ML? I already did a test with the lav and I can hear the internal mic through the headphones. Will ML separate those tracks like it does in 5d MK2 ML? Hey @DeafEyeJedi thanks for the quick reply. Can you please send details on 5d mk3. 1. Do you get MLV RAW with sound and you find that better than the ProRes422HQ with sound on the Shogun? 2. Do you know the color bit info on the MLV RAW and ProRes422HQ? Do you do post color corrections in Resolve, AE, both, etc? 3. Which firmware are you using to get both MLV RAW and ProRes422HQ? 1.1.3? Build? 4. Do you get ML Overlays while mirroring both? On both monitors? 5. Do you use RAW (1.0 Version)? 6. Do you use ML Viewer and export your MLV RAW or export DNG? Thanks again for the help. Thanks to all the ML community for the support and progress. 2) MLV is 14-bit as per usual when ProRes422HQ from Shogun is only 8-bit (YCbCr 4:2:2) since that's the best for 5D3's HDMI output according to Canon. 5) Yes I do, in fact, I have been using MLV Lite lately which is just as good if not better. MLV files were processed with MLP (with default settings and nothing else) just for this test purpose. I noticed you have ETTR option on the bottom of your ML Overlay. Do you know if I can get the same option on the 5dmk3 Fir113? Or do I have to use the histogram? Excellent sound. And if my eyes and ears don't deceive me - you have both a shotgun mike and a label mike attached to the Shogun. Excellent, and a good enough quality for broadcast interviews. A lot of hard working and experimenting ML-users, who excel in good raw footage should see your demo video and try experimenting with "raw sound" as well instead of just putting a piece of music in their movie. When you master the shooting, playing with natural sound makes the experience complete and very satisfying. Gotta go get me a Shogun one of these days - I've found a good teacher, DeafEyeJedi!!! Latest: I can understand why you used the venerable 7D, since it has a full Audio/ML menu. How does your setup work with 5D3 (both versions)? @axelcine -- I'll do another test comparisons in between 113 & 123 re: audio wise on 5D3 as soon as I can. Meanwhile, here's this screenshot that helped my decision making in purchasing the Shogun. 6. a lightweight monitor model (possibly not over 450gr). So I'm in doubt (I'm a newbie here), and I decided to wait for someone that could suggest any tested monitor model that possibly fits my six points. Thanks really really much for your help. I'm a bit late to this forum posting, but I use a MustHD 7 inch monitor. Very accurate colors, has HDMI lock, HDMI in and out, and works flawlessly with my 7D. There are HDMI options in the 7D ML Menu, I believe I use 16:10 HDMI. I just purchased the Atomos Ninja Blade to monitor while shooting RAW on my 7D. Any suggestions? I guess the Blade doesn't read an input lower than 1080? If it can't monitor while filming in RAW, it's kind of useless. Maybe you can try Feelworld 7'' monitor.I buy it from Alibaba,and I think it is very nice. It is IPS panel,1280*800 resolution(support 4K UHD 3840*2160p is optional),HDMI AV in,and functions like Exposure,Histogram,False Colors,Peaking Focus Assist ,etc. And it is light weight 0.4KG,super slim 17mm thick. Does anyone know what the specific frame-rate and size for the 7D setting 'Force HDMI-VGA.' Is it 720p23.98? According to the Atomos website, the Ninja Blade accepts 720p60, 720p59.94, 720p50, & SD 480i. I'm still hoping to get the monitor to work while shooting RAW on the 7D. Any help is appreciated! *Monitoring on the Blade works when I have the Canon settings at 1280x720p60 - with ML 'FPS Override' set to 23.98. When I import the footage, the image is squeezed vertically (1728x584 for 16:9), which requires extra scaling in the computer. Does anyone know if I lose information filming this way? Thanks. I use a SmallHD AC7 when recording raw. No problems so far, though I am still using 1.13. I wouldn't mind if it were a little smaller (I think that 5" would be perfect for this camera), but sometimes the extra real estate is nice -- especially when dealing with the super shallow DOF of the 5D. It also has a useful anamorphic scale mode if you ever shoot with those lenses. Interesting. Since you used 1.1.3 you could only see the monitor while the camera screen was black right? i.e. not being able to use both cameras and external monitor at once. Are you able to see verything on the monitor from overlays, zebras, LUT, etc. However, I am trying to find SmallHD AC7 but it seems that it no longer sold and discontinued. What is the new upgrade version of AC7? A 5 inch would be sufficient. I have pretty much the same question but with a lower budget. 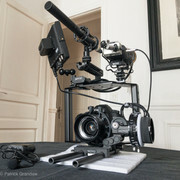 I need a monitor for my 5dmk3 with a ronin-m. I need it to work with 1.1.3. I just need it to assist me in framing and focus while I move with little to no latency. The reason I like this monitor (1920x1200) is a nice build, bright enough for the money, ($190 on Amazon) and 7 programmable buttons. It has built-in zebras, false color, histogram, peak, audio levels, etc., and can also run off the included DC power! It accepts 4k input. 1) SOUND - If using the 5diii, TURN OFF the Bestview monitor's audio meters function that's built into the monitor* and use ML's meters display to monitor because the sound doesn't carry through the HDMI output from the 5d to the monitor via the cable - at least not in ML 113. Since I record sound externally, I pump it back into the line input on the 5d. You can easily set input levels on the 5d manually to match external recorder levels (I use Zoom h5 with shotgun or lavalier mics). This way you're recording a great reference/backup track to sync your external audio later. 2) HISTOGRAM/ZEBRAS - My main struggle I'm trying to figure out is the difference in EXPOSURE histogram/zebra levels between ML and the monitor's built-in histogram when exposing via ETTR. The test footage I've recorded show ML as being correctly exposed to the right, whereas when I've set exposure using the monitor's built-in histogram/zebras for exposure, it records somewhere between 1-1/3 to 1-2/3 underexposed. I'm sure this is somehow due to the 5d's limited output from the HDMI that the monitor is reading to determine levels. Unfortunately I don't see anywhere to compensate to be able to use the monitor's built-in histogram or zebras. 3) FALSE COLOR - I prefer ML's false color over the built-in one. Bestview's whites and blacks come through both as different shades of magenta and I don't see anywhere to change the color scheme in the menu. ML shows a nice difference throughout the exposure spectrum, easier to read. My preference is to skip the monitor's fun functions and to use all ML's display options which show through on the monitor because exposure all appears accurate after processing. (I use MLV app https://ilia3101.github.io/MLV-App/ and edit in Resolve). Does anyone know if the "clean HDMI" output in ML's 5D v123 somehow addresses the inconsistency of exposure levels between ML and external monitors? Or could this possibly just be an issue with this particular monitor or setup? Thanks, and I enjoy the reading! Canon 5D3,1.1.3 CF-SanDisk Extreme PRO,160MB/s, 256GB, SD-SanDisk Extreme, 90MB/s, 32GB.